Have you ever heard the old adage, “April showers bring May flowers”? This year, in the Pacific Northwest, we think it should be “March showers bring April flowers”. While all the rain produces some stunning early bloom flowers and tree buds, it makes it difficult to get outside and enjoy them. In an effort to help people through the month of March, as well as learn about crafting and all it’s benefits, the Craft and Hobby Association founded National Craft Month in March of 1994 and it has been going strong ever since. According to the Craft and Hobby Association blog, National Craft Month has grown from only a few craft manufacturers in the beginning; into an international celebration with millions of craft hobbyists participating in it world-wide. The art of crafting holds many benefits for the elderly. Not only is it a great way to pass the time, but using your brain and motor skills to be creative helps increase brain health and overall happiness. 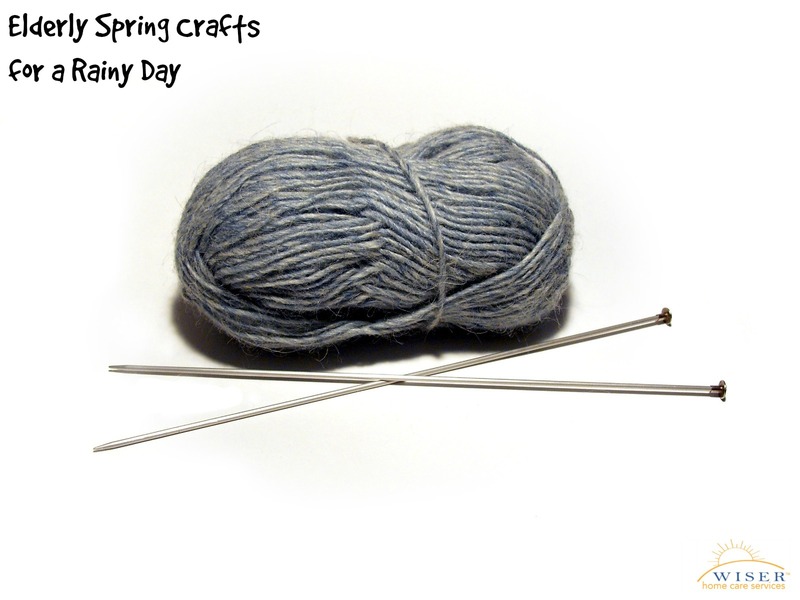 To help your elderly loved one get the most out of National Craft Month we have gathered several of our favorite Spring-time crafts. We hope you enjoy them as much as we have. Happy Crafting! In this easy craft your elderly loved one will turn a metal colander into a hanging flower pot. All you need is a colander, dirt, twine and your elderly loved one’s favorite spring plant or seedlings. You can find the tutorial here. We love puns almost as much as we love sewing. This blog (Click Here) has several great sewing projects for beginners. Several of them are Summer-themed, which means they are perfect to start in Spring so they can enjoy the finished product all summer long. All the elderly men will get a kick out of this clothespin airplane craft. (See it here). The fun doesn’t stop when the plane is finished though, hold a clothespin airplane race to see whose can fly the best. Ok, so it might be for kids, but trust us when we say, it is fun for people of all ages. This craft uses plastic forks and paint to create beautiful dandelion art. Find it here. Did you ever have a chia pet growing up? They typically resemble a head and if you pour water on them they sprout grass. This simple tutorial shows you how to make your own hedgehog chia pet by using a sock, water and grass seed. With the exploding popularity of Pinterest, Mason jars aren’t simply for canning anymore. This blog shows several cool crafts you can do with your elderly loved one to turn their mason jars from sham to glam. Whatever craft you choose to do with your elderly loved one, the most important thing is that you have fun. We would love it if you shared your craft experience and pictures with us.